I like a challenge, so I've decided to join others in the craft/blogging world and I'm participating in the Gussy Sews Inspiration Workshop. By the way, if you haven't ever been to Gussy Sews - you must take a detour when you're done reading this and check out her blog and her shop. Maggie is the creative soul behind Gussy Sews - and she is one talented woman - inspirational too. This weeks prompt is to blog about something handmade. Handmade. I could write about a lot of things, but I've decided to write about the first thing that came to my mind. ....& that would be potholders. Random, I know. 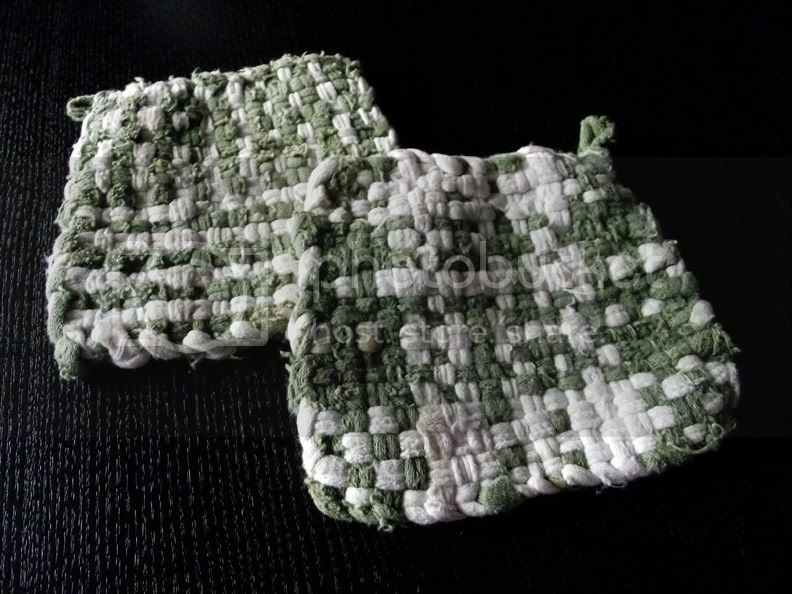 ...But take a look at my handmade potholders. They have a story. I was quite the little crafter when I was a child. I loved making things. Art, jewelry, and....yes, potholders. I made quite a few of these actually. ...And somehow, these are the only ones that have stuck around with me through time. Even though I'm in my thirty's now, and have moved around a few times, these potholders have survived all the moves with me. Before I tied the knot in 2006, I did what every Bride-to-be does and registered for everything under the sun. That included new potholders, which I received, still have, and still use. ...But I think I love these little boogers so much because I poured my heart into them when I was a child. I can remember making them. Although they aren't beautiful, I thought they were at the time and was proud of them. Even though these are old, they're still functional and work great. Back then, I never imagined I'd be blogging about them today, but I appreciate the opportunity to do so and enjoyed the walk back down memory lane.